*Winning selection holders for a lifetime annuity may choose between the annuity or the specified lump sum. When there is more than one winning selection in a same category at a same draw, annuity prizes are replaced with the applicable lump sum, that will be shared amongst the winners in the category (see terms and exclusions in the Game Conditions). 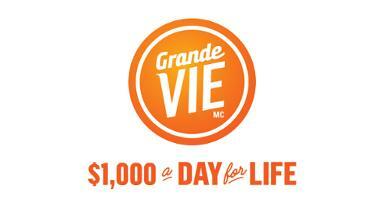 Imagine, $1,000 a day for life... now that's just grand! Your tickets are purchased automatically according to your specifications! Marie Immacula always knew she would win someday. And now she has. She plans on taking a vacation and pampering her loved ones. Congratulations to Jean-François. Playing online really paid off! DEADLINE FOR WAGERS: Mondays and Thursdays at 10:30 p.m.
Each draw is conducted as follows: ILC will cause five Main Numbers to be drawn at random among all numbers from 1 to 49 and one Grand Number to be drawn at random among all numbers from 1 to 7. Find out more about how draws are conducted. You may play online, using the mobile app or at a Loto-Québec retailer where you can pick your own numbers or opt for selection(s) randomly generated by Loto-Québec’s computer. One play is comprised of one selection of 5 Main Numbers and one Grand Number (GN). 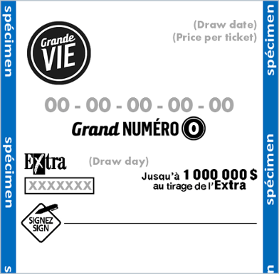 Grande Vie is governed by the Rules and Regulations respecting Lotteries and Lottery Tickets of the Interprovincial Lottery Corporation (ILC), which include limitations of liability. *Winning selection holder for a lifetime annuity may choose between the annuity or the specified lump sum. The lump sum of the “$1,000 a day for life” annuity is $7,000,000, that of the “$25,000 a year for life” annuity is $500,000. When there is more than one winning selection in a same category at a same draw, annuity prizes are replaced with the applicable lump sum, that will be shared amongst the winners in the category (see terms and exclusions in the Game Conditions [PDF - 64 KB]).